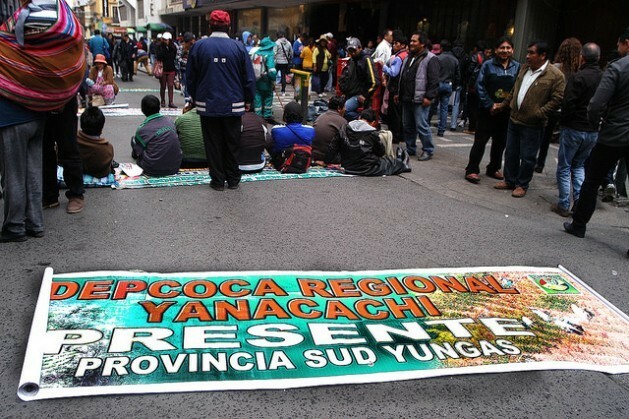 Coca leaf growers from the traditional region of Yungas, in northwest Bolivia, surround the legislature in the city of La Paz, demanding an expansion of the legal cultivation area by the new law. Credit: Franz Chávez. LA PAZ, Mar 9 2017 (IPS) - A new bill in Bolivia, which will allow the amount of land allocated to producing coca to be increased from 12,000 to 22,000 hectares, modifying a nearly three-decade coca production policy, has led to warnings from independent voices and the opposition that the measure could fuel drug trafficking. Since 1988, the amount of land authorised for growing coca has been 12,000 hectares, according to Law 1,008 of the Regulation of Coca and Controlled Substances, which is line with the 1961 Single Convention on Narcotic Drugs. This United Nations Convention pointed the way to a phasing-out of the traditional practice among indigenous peoples in the Andean region of chewing coca leaves, which was encouraged during the Spanish colonial period, when the native population depended heavily on coca leaves for energy as they were forced to extract minerals from deep mine pits. But the traditional use of coca leaves instead grew in Bolivia. According to the president of the lower house of Congress, Gabriela Montaño, some 3.3 million of the country’s 11 million people currently use coca in traditional fashion. Citing these figures, lawmakers passed the new General Law on Coca on Feb. 24. The bill is now awaiting President Evo Morales’ signature. “This law is making available to the drug trafficking trade more than 11,000 metric tons of coca leaves per year, the average yield from the 8,000 hectares which the law grants to producers.” – Public letter signed by local intellectuals. Morales originally rose to prominence as the leader of the seven unions of coca leaf growers in the central region of Chapare, in the department of Cochabamba, fighting against several conservative governments that wanted to eradicate coca cultivation, in accordance with Law 1,008 and the U.N. Convention. The law had enabled the anti-drug forces, financed by the U.S. Drug Enforcement Administration (DEA), to wage an all-out war against coca cultivation. The struggle against the law catapulted Morales as a popular figure and later as a politician and the country’s first indigenous president, in January 2006. Montaño estimates that annual production amounts to 30,900 metric tons, 24,785 of which are used for medicinal purposes, in infusions or rituals, she said. The remaining 6,115 tons are processed into products, or used for research and export, she said. Assessing compliance with the 1961 Convention, medical doctor and researcher Franklin Alcaraz told IPS that in South America, only Ecuador has managed to eradicate the practice of chewing coca leaves. Bolivia was one of the 73 signatory countries to the 1961 Convention where clause “e” of article 49 declared that the practice of chewing coca leaves would be banned within 25 years of the (1964) implementation of the accord. In January 2013, Bolivia recovered the right to practice traditional coca chewing, when it won a special exemption to the 1961 Convention. Its request was only voted against by 15 of the 183 members of the U.N., including Germany, Japan, Mexico, Russia, the United States and the United Kingdom. 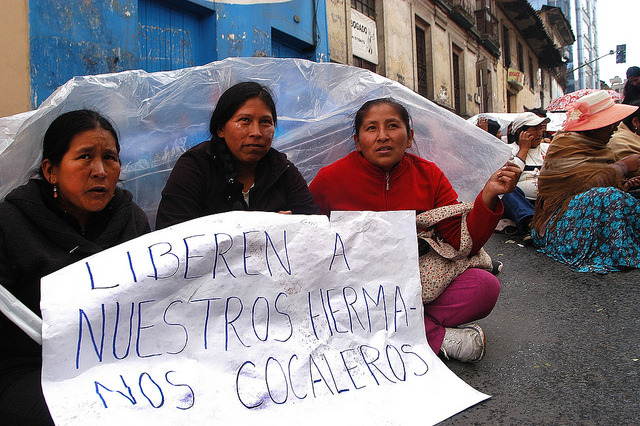 Wives of coca leaf farmers from Yungas during a vigil at the gates of the La Paz police station, where dozens of leaders were taken, accused of inciting disturbance during the demonstrations held to demand an expansion of the legal cultivation area in their region in northwest Bolivia. Credit: Franz Chávez. The new bill repeals the first 31 articles of the 1988 law and legalises 22,000 hectares for cultivation – 10,000 more than before. In practice, the new legal growing area is just slightly larger than the 20,200 hectares of coca which UNODC counted in 2015, according to its July 2016 report on the country. President Morales has defended the increase in the legal cultivation area and reiterated his interest in carrying out an old project for the industrialisation of coca leaves. On Feb. 28, Morales expressed his support for the new bill and accused conservative governments of supporting the demonisation and criminalisation of coca leaf chewing at an international level. Montaño said that in 2006, when Morales first took office, 17,000 hectares of coca were grown in the Chapare region. Ten years later, UNODC registered only 6,000 hectares devoted to coca production. She said that under Morales, the reduction of coca crops has been negotiated and without violence, in contrast to the repression by conservative governments that generated “blood and mourning”. Before Congress passed the law, coca producers from the semitropical region of Yungas, in the department of La Paz, held violent protests in the capital. Between Feb. 17 and Feb. 23, hundreds of demonstrators surrounded Murillo square in La Paz, where the main buildings of the executive and legislative branches are located, demanding 300 additional hectares, on top of the 14,000 presently dedicated to coca in Yungas. There are an estimated 33,000 coca farmers in Yungas, and 45,000 in Chapare. In the midst of clashes with the police, destruction of public property and the arrest of at least 143 organisers, talks were held with the government, which ended up giving in to the demands. The settlement also granted growers in the Chapare region an additional 1,700 hectares, on top of the 6,000 currently registered and monitored by UNODC. Political analyst Julio Aliaga told IPS that traditional use of coca leaves only requires 6,000 hectares, rather than the 22,000 hectares that the government of the leftist Movement Towards Socialism (MAS) is about to legalise. This figure of 6,000 hectares is drawn from a European Union study on demand for coca leaves in Bolivia for infusions, chewing or in rituals. This study was not mentioned by the authorities or MAS legislators. “Bolivia has a large surplus of coca which goes toward drug trafficking. The cocaine ends up in Africa, Europe and Russia, and the new colossal market of China,” Aliaga said. “The new policy will be indefensible before multilateral drug control agencies,“ since the UNODC certified that “94 per cent of the coca production from Chapare goes toward the production of cocaine,” he said.